Runkuraqay or Runku Raqay (Quechua runku basket, raqay shed / derelict house / ruin) is an archaeological site on a mountain of the same name in Peru located in the Cusco Region, Urubamba Province, Machupicchu District. It is situated southeast of the archaeological site Machu Picchu and south of the Vilcanota river. The ruins lie on the southern slope of the mountain Runkuraqay near the Runkuraqay pass, northeast of the archaeological site Sayacmarca and southeast of the site Qunchamarka. Hiram Bingham III visited the site in April 1915. Paul Fejos visited in 1940. 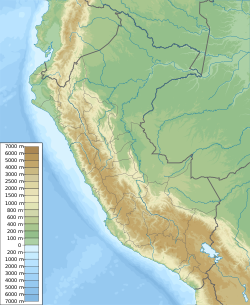 ^ Note: The dictionary of the 'Academia Mayor de la Lengua Quechua' gives Runru Raqay as an alternative. ^ Bingham, Hiram (1952). Lost City of the Incas. Weidenfeld & Nicolson. pp. 252–253. ISBN 9781842125854.